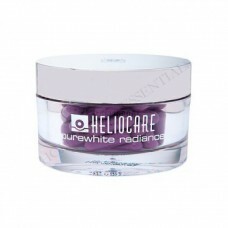 LUXURIOUS, POWERFUL AND EFFECTIVE COLLAGEN ANTI-AGING SKIN WHITENING BEAUTY SET! WAKE UP TO BEAUTIFUL SKIN EVERYDAY! Power up your skin whitening treatment and experience an intense transformation with our Taut® Premium Collagen Drinks, revitalize tired dull skin, and see freckles, scars and any pigmentation fade away. 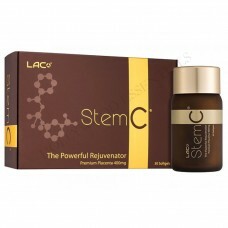 Dramatically improve your skin concerns and experience a radiant transformation with younger, lighter, even toned skin. Taut Premium Collagen is formulated with highest potency 13,000mg Marine Hydrolyzed Collagen with patented technology and anti-aging ingredients most effective to visibly reduce signs of aging and promote firmer, youthful radiant skin. Drink every night before going to bed for 21 days to see visible results. This intense program works synergistically to help restore aging skin, whitens the skin, giving you an even skin tone, minimize appearance of fine lines and wrinkles and protect your skin from free radicals damage. Great Tasting Orange Flavor! Developed from the most trusted and high-quality skin whitening and anti-aging ingredients, Taut® Premium Collagen PLUS Placenta Drink Skin Whitening Set contains the latest and most powerful all natural anti-aging and skin whitening ingredients that whitens dark spots, lightens acne scars and clarifies uneven pigmentation for that spotless white, beautiful skin! Purest and safest source of collagen: Deep water red snapper fish. Highest degree of purity and effectiveness. Collagen is the key building block of the dermis layer of our skin. It functions very much like the frame of our house. Without a strong frame, your house starts to get cracks and fall down. There are 28 type of collagen in our body. Our dermis layer is made up of 85% type I and 15% type III collagen, fibroblasts, elastin and hyaluronic acid. Together they are the key components for the extracellular matrix which gives our skin its structure, elasticity and firmness. Unfortunately after we turn 30, our body stops producing collagen and we start to lose 1-2% every year. This skin graph shows the collagen intensity in our skin dermis at different ages. Yellow and Orange shows high intensity of collagen when we are in our 20s and 30s vs green and black, which is low intensity after age 40. 1. 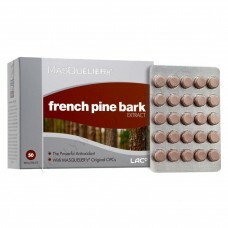 Diminished elasticity, fine lines, wrinkles and sagging skin. 2. Dull, dry and fatigued skin. Collagen molecule at its native state is too large for our body to digest and the pores of the epidermis to absorb. However, LAC Taut® Collagen Drink plus Placenta uses the revolutionary patented hydrolysis technology that breaks down the super collagen molecule (300,000 Daltons) into micro-sized tiny pieces called collagen peptides (average size 3,000-5,000 Daltons) small enough to be readily absorbed and penetrate into the dermis layer of the skin. Clinical studies show ingesting 10,000mg hydrolyzed collagen a day for 8 weeks helps to increase skin collagen and reduce fine lines and wrinkles, increase elasticity and hydration. 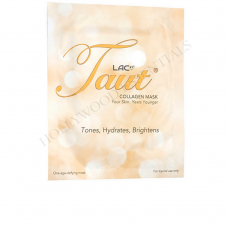 Each serving of LAC Taut® Collagen Drink plus Placenta delivers 13,000mg type I hydrolyzed marine collagen peptides (90% Type I and 10% Type III ) with hyaluronic acid, chondroitin sulfate and other key anti-aging ingredients. 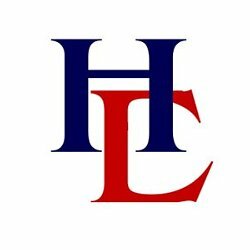 Rather than providing amino acids that have to be broken down and then reassembled into collagen, hydrolyzed collagen is able to deliver small, usable chain peptides efficiently into skin dermis and trigger collagen production in the skin. Our body detects the high concentration of collagen peptides (13,000mg) in our bloodstream, triggers the wound response. This healing response is very similar to what happens when you cut your finger or sustain an injury. This wound repair response in turn activates a group of specialized cells in the dermis called 'fibroblast' to begin producing collagen again. In addition, Taut's hyaluronic acid and chondroitin sulfate (elastin) with other key ingredients help to restore the elastin and hyaluronic acid in the dermis of our skin, providing the moisture, suppleness, elasticity needed to promote younger smoother skin. The graph shows ultrasound images of a 60 year-old woman’s face after drinking one bottle of Taut Collagen every night for the first eight nights, and then every other night during an 8-week clinical study. You can see below that after 8 weeks, her collagen intensity has improved dramatically. Skin appears smoother with denser collagen structure (the yellowish orange areas) than before drinking Taut Premium Collagen. 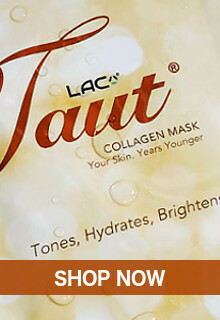 Are LAC Taut® Collagen Drink and LAC Taut® White suitable for all skin types and ages? 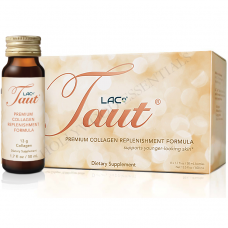 LAC Taut® Premium Collagen Drink is an age-defying skin whitening beauty supplement and LAC Taut® White is an age-defying skin whitening supplement. Both are suitable for adults of any age, gender and skin type. Who are those unsuitable to take LAC Taut® Collagen Drink and LAC Taut® White? Those who are allergic to any ingredient in LAC Taut® Collagen Drink and LAC Taut® White should not consume them. Also, those having any serious illness and/or are under medication should consult their doctor before use. Vegans may wish to note that LAC Taut® Collagen Drink contains fish collagen and placenta. Is it necessary to take LAC Taut® Collagen Drink with LAC Taut® White? Do I need other supplements? 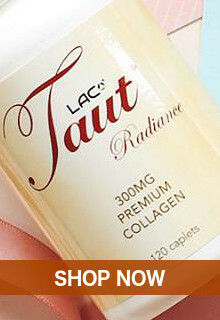 LAC Taut® Collagen Drink is a comprehensive beauty supplement that can be taken alone for maintenance of healthy skin. 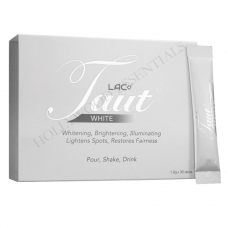 Those who desire fairer skin or wish to reduce pigmentation or blemish marks can include LAC Taut® White in their skincare regime. In cases of dry skin, essential fatty acids, namely Omega 3 & 6, are also recommended to enhance the skin's moisture retention ability. Do I consume LAC Taut® Collagen Drink and LAC Taut® White everyday? 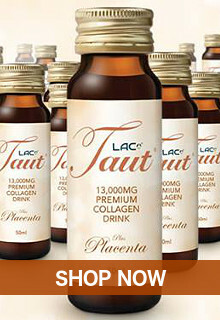 It is recommended that one consumes LAC Taut® Collagen Drink at least 3 to 4 times a week. For intensive results, it can also be taken daily. 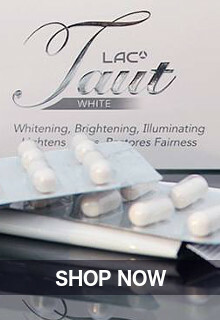 LAC Taut® White is formulated for daily intake. Do I need to consume LAC Taut® Collagen Drink every day? For first time users and to achieve optimal results, we recommend consuming Taut every day for the first 21 days to supercharge collagen production in your dermis. After you have achieved your desired results, you may switch to drinking Taut every other day or 3-4 times a week. 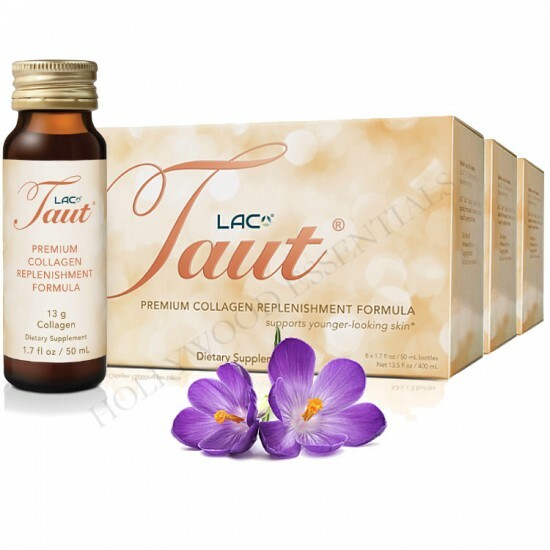 LAC Taut® Collagen Drink and LAC Taut® White are advanced anti-aging skin whitening beauty supplements with superior nourishing and restorative properties. Its benefits may be seen in as quickly as a week's time of daily intake for most people. As individual's response time and extent of skin damage differ, some may take a longer time to see and feel results.